I know, I’ve been bad again not writing in my own blog. 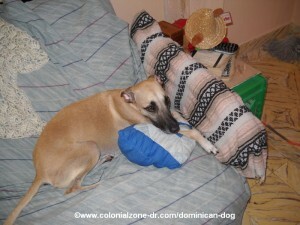 I have just been so busy trying to update the web site, writing in the Colonial Zone News Blog and making the newest blog in the collection, The Dominican Dog Blog. I got a dog, thus the Dog Blog. 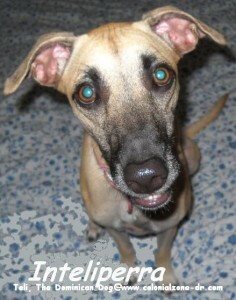 Her name is Inteliperra. Not inteligente, which means smart, I figured inteli – GENTE means smart person cause it says Gente which maens people. My dog is not a gente she is a perra so I called her Inteli – PERRA. Get it? For short she is just Teli. She is smiling in this picture. Isn’t she cute? She is the normal type of dog breed you see in the streets here in Dominican Republic. Wiry, thin, tan with the black face. They call them here Boca Negra (Black Mouth), Vida Latta (sort of lives out of a tin can which also means a mixed breed). She looks alot like a Belgin Malinois. But no matter what she is I fell in love with her after a few days of her living with me on November 3rd. Now she is my baby and she stole my heart. She is a bit of a nervous dog. She knows how to walk on the leash and I have taught her lots of tricks. I know her other owner taught her stuff too. (She was found in a park when she was a puppy almost dead, was rescued and brought back to health and loved, then the family had to move to a smaller home and couldn’t keep her, this is how she came to live with me). She likes to hang out on the sofa when I am working and she always likes to be where I am. I have been working with her but she is so nervous and frightened. When she gets in the fright mode she doesn’t hear anything. She just wants to get home. She is much better but she still needs lots of work and love. She doesn’t like open doors when we pass them in the street. Any sudden noise she goes crazy. The rustling of the palm trees she gets nervous. When we pass the school and she hears all the noise inside she gets nervous. She hates when there is a marching group in the street. She is afraid of the washing machine. She wont come to the living room when I have laundry hanging on the enclosed balcony. She doesn’t like waving flags. Sometimes I think she sees ghosts when she jumps at nothing. But I am working with her. She needs to get calm so she can work her business being a tour guide here in Colonial Zone. She is working on being the mascot for the Zone. She already has her own park, Plaza Pellerano Castro, where if you want to meet her, she is usually walking around there in the evening. She has her own Colmado where she is the Mascot it is across from her park, Colmado Omar I. Common down and she will always accept 10 pesos of salami if you want to buy. Just remember, you have to ask me first before you give her a treat. She is not allowed to accept stuff from strangers unless I say its OK first. You might also see her in her favorite place to go to the bathroom, in front of the Forteleza Ozama on Calle Las Damas. She gets to go to the bathroom in front of one of the oldest forts in the new world and on the oldest street. She also likes to walk in the church yard at the Cathedral, the oldest in the new world and the Plazoleta de los Curas because it is usually quiet there. So if you want to keep up on the Dominican Dog, Teli. 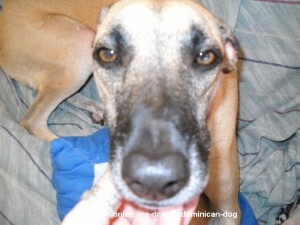 Please check her blog, The Dominican Dog blog. Also if you want to adopt your own dog please consider a shelter dog. They are such a blessing and they need so much love and will give it as well. There are many shelters here in Dominican Republic. If you want to adopt a dog here send me an email and I can direct you to many of the places here in Santo Domingo. Just a Story, My Favorite Stories adopt, baby, blog, boca negra, Colonial Zone, dog, dominican dog, dominican republic, mascot, nervous, perra, shelter, street, teli, tour guide, vida latta. permalink.